“The Kiss of the Oceans” was the inaugural exhibition of the Society of California Pioneers’ new museum and research center. It featured audio clips of music, speeches, and interviews with fair attendees and explored the souvenirs, early electrical appliances, photographs, diaries, and scrapbooks left from the Panama Pacific International Exposition. 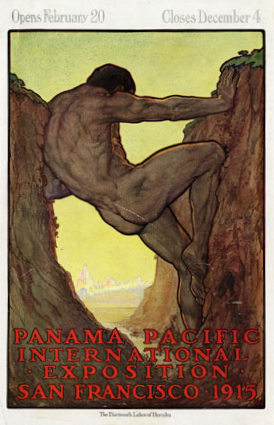 The exposition occurred when the city was still suffering from economic aftershocks of the 1906 earthquake, but by attracting over 18 million visitors to San Francisco within one year, the Panama Pacific International Exposition greatly improved the city’s economic situation. Due to the fair’s incredible colored lights and fanciful pavilions, the Marina District soon became known as Jewel City. Focusing on the spirit of social and technological progress exemplified by the opening of the Panama Canal and the rapid rebuilding of San Francisco after the earthquake and fire, this exhibition explored the expansive opportunities these celebrated events promised for westward travel, trade and transportation.